Читайте в номере: АРИЯ, ATROCITY, AT VANCE, AVULSED, BEHEMOTH, BURZUM, CARPAHIAN FOREST, CATHARSIS, CELTIC FROST, CHRISTIAN DEATH, CORVUS CORAX, CREMATORY, DIE FORM, DIMMU BORGIR, DISMAL EUPHONY, DREAMS OF SANITY, ERIC NORLANDER, GLENN HUGHES, GRAVE DIGGER, GREEN DAY, ICE AGES, KINGDOM COME, L'AME IMMORTELLE, LANA LANE, LABYRINTH, МАВРИК, MEGADETH, NARNIA, NILE, ONKEL TOM ANGELRIPPER, OVERKILL, PARADISE LOST, PRIMAL FEAR, SKYCLAD, SLASH, THE 69 EYES, THRON, WHITE SKULL, WITT, ZYKLON 32. А также: НОВОСТИ (Metallica, Ozzy, Limp Bizkit, Fear Factory, Pain, Immortal, Arch Enemy, Borknagar, Lefay, Lacrimosa, др. 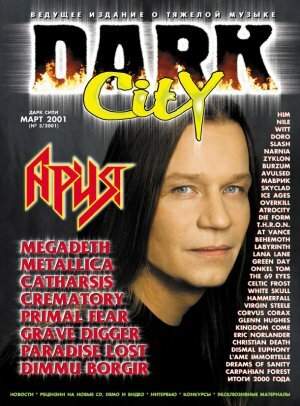 ), АНКЕТА DARK CITY (Virgin Steele, HIM, Hammerfall, Doro), ПОЧТА DARK CITY (Metallica, объявления, знакомства, Miss DarkCity-2001), КОНКУРСЫ (Paradise Lost, Behemoth, Thron, Mortem), DARK CITY SPECIAL (Самый страшный ночной кошмар в вашей жизни), ИТОГИ 2000 ГОДА (Iron Maide, Ария, Cradle Of Filth, Boney neM, др. ), РЕЦЕНЗИИ НА CD (Aborym, Aghora, Dornenreich, Forefather, Jack Frost, Korozy, Moonlight, Untoten, др. ), DEMO ZONE (Arafel, Blank, Mind Eclipse, Out Standing, S.C.A.L.P., Vae Solis, др. ), РЕЦЕНЗИИ НА ВИДЕО (Alice Cooper, Cannibal Corpse, Project Pitchfork, S.O.D., Stratovarius, др. ).